THERE WAS A TIME when the village atheist sounded somewhat intelligent or was at least interesting, if not original. Today, he could double as the village idiot. Driving to work, I had the misfortune of tuning in to the morning mouth on a local talk station. In an effort to goad listeners into reacting, he declared that religion is dying in America and (in his opinion) a damned good thing it is. The excuses given for this Madalyn Murray O'Hair tirade were a case of clerical misconduct and the reported appearance of the Virgin Mary in a freezer chest. On the other hand, he may just have been having a spiritual bad-hair day. He claimed that the Catholic Church can't recruit priests, that Jews are intermarrying, so they're disappearing, and that by and large people are too savvy to fall for a bunch of "shabby card tricks performed 3,000 years ago." The host, a libertarian, quoted Karl Marx's dictum that religion is the opiate of the masses. 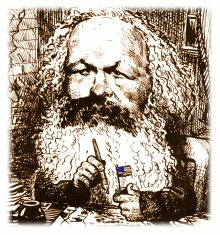 Interesting that this a.m. proponent of laissez-faire believes the father of communism was so wrong about economics yet so right about metaphysics. Still, no discussion of faith should neglect the prophet of the proletariat. The horrors of the 20th century -- shaped by intellectuals like Marx and Friedrich Nietzsche -- show the true face of a world without God. The century's mass murderers (Hitler, Stalin, Mao and Pol Pot) all were godless men. They offered humanity a world free of the drug of divine love. The result was death camps, gulags and killing fields. Religion dying in America? I doubt it. Today, 63 percent of American families say grace or give thanks before meals, compared to 43 percent in 1947. There are two Americas, one militantly (or inadvertently) secular, the other religious or groping in that direction. As the Bible says, by their works, you shall know them. An appreciation for the redemptive power of faith is cropping up in the most unlikely places. Lately, our devoutly secular news magazines have discovered that religion treats social trauma. The April 20 issue of Time magazine had an article on "Brother Bill" Tomes of Chicago, a Catholic lay worker who, on 53 occasions, has used his body to keep gangs from shooting up the streets and each other. Time comments, "He understands that he can be killed, but he knows that this is the core of his work, and he feels an absolute peace." Newsweek responded with a June 1 cover story ("God vs. Gangs: What's the Hottest Idea in Crime Fighting? The Power of Religion") on Boston's Rev. Eugene Rivers, a Pentecostal. The magazine observes that both liberals and conservatives are drawn to the conclusion that: "The only way to rescue kids from the seductions of drug and gang cultures is with another, more powerful set of values. ... And the only institution with the spiritual message and the physical presence to offer those traditional values ... is the church." The inner city isn't the only place where youths are, in the popular expression, "at risk." (Roughly 10 percent say they regularly bring a gun to school.) Their need isn't being met by listening to radio talk shows. Since a 1990 Supreme Court ruling declared them constitutionally kosher, more than 3,000 after-school prayer groups have formed to bring adolescents the word. In his new book, Civility, Yale law professor Stephen Carter identifies the underpinnings of this virtue (the glue that holds society together) as kindness, compassion and a willingness to sacrifice for strangers. Except for totalitarian ideologies, people aren't drawn to sacrifice for secular ideas. It's been 37 years since a politician called on the American people to sacrifice -- to give up something for an ideal. Carter writes: "A revival of civility in America will require a revival of all that is best in religion as a force in our public life. Only religion possesses the majesty, the power and the sacred language to teach all of us, the religious and the secular, the genuine appreciation for each other on which a successful civility must rest." It isn't God who's dying, but the archaic notion that we can somehow live without him, that a ship without moorings won't quickly become a storm-tossed wreck. In the 19th century (the high noon of humanistic optimism), it was still possible to believe that religion was optional. As we reach the bitter dregs of the most godless -- and, consequently, most murderous -- era in history, that quaint illusion has proven as transitory as the conversation on a morning talk show.